​Mark your calendars now for the Arnprior and District Quilters' Guild's 2019 quilt show! 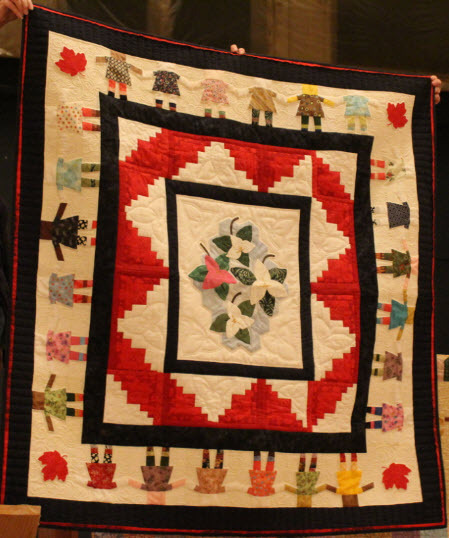 See Our Quilts for photos of quilts made by guild members. This stunning custom quilt will get a lucky new owner at the quilt show where the winning ticket will be drawn. Proceeds will be used to fund future charity projects by the guild. It is currently on display at Sew Inspired in Arnprior where tickets are also available. You can also purchase tickets from guild members. The show is in Arena A, the arena just in front of the main door at the Nick Smith Centre in Arnprior. The tea room is located in the room to the right of the main entrance door. The show will feature quilts of all sizes - bed quilts, lap quilts, baby quilts, preemie quilts for the little babies in the Rich Little Special Care Unit at the Ottawa Hospital Civic Campus, other quilted items such as tablerunners, wearables, wall hangings and bags, as well as a dedicated Christmas section. See Our Quilts for photos of quilts made by guild members. Clothespins are attached to the quilts so that you can see the back without touching the quilts - show etiquette is no touching! There will also be volunteers walking around with white gloves should you need assistance, or want a closer look at something. Choose your favourite quilts and vote for Viewer's Choice and Modern Quilt! While at the show, don't forget to visit the vendor mall in the arena with shops from around the region offering their newest treasures. ​There is a lot to see and there will be chairs in the arena for you to take a break. Plan to have a longer break and meet new friends in our tea room, where you can have a light lunch, drink, and dessert of homemade pie.